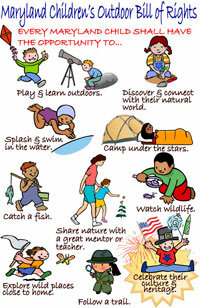 Start with Maryland "Children's Outdoor Bill of Rights" (featured from their site here above). Choose where to go next through their pictoral links or tabs. Get information on green schools, crafts, community resources, "making a difference," "cool places" to go, and Maryland Park Events (such as the Maryland ParkQuest). There are resources featured specifically for parents, educators, and children (including February 18--21st's Great Backyard Bird Count or learn what "Green Hour" is). They also have tons of kid-friendly info sheets about animals & the outdoors, activities to get kids moving and grooving, and upcoming workshops for adults and children alike. Do you have to be a Marylander to appreciate this site--not at all!! Yes, obviously some of the events are local, but given the wealth of resources on site, it's a definite great find! Make a rendezvous to go to http://www.dnr.state.md.us/cin/. While you're there, check out the 2 videos...especially the "Polar Bear Sky" one at the bottom of the "Children in Nature's" page to see Maryland Green School students make imagery come alive! !